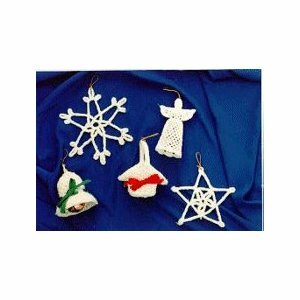 This basket ornament is one of the set of Five Ornaments that has been available on this site for over a year. This would be perfect for hanging on the tree and placing a small gift inside it for that special someone. Or it can be used at Easter as a little tiny decoration. Small amount white baby yarn. RND1: Ch 5, join with sl st to first ch to form ring. Ch 4, *dc in ring, ch 1. Repeat from * 9 times total. Sl st to 3rd ch of ch 4. RND 2: Sl st into first ch 1 sp. Ch 4, dc in same sp, *dc, ch 1, dc in next ch 1 sp. (vst made). Repeat from * around. Sl st to 3rd ch of ch 4. RND 3-5: Sl st into first vst. Ch 4, dc in same sp. Vst in each vst around. Sl st to 3rd ch of ch 4. RND 6: Sl st into first vst. Ch 4, dc in same st. *vst bet vsts. Vst in next vst. Repeat from * around. Sl st to 3rd ch of ch 4. RND 7: Sl st into first vst. Ch 4, dc in same st. Vst in vst around. Sl st to 3rd ch of ch 4. Ch 24, sk 9 vsts. Take care not to twist ch. With beg side toward you, working in 10 th vst, sl st in right dc, ch 1, sl st in left dc, then sc in each of the 24 sch back to the beg side. Sl st into next dc of first vst. Fasten off and weave ends into work. Dip basket into fabric stiffener. Shake out excess stiffener. Place jug cap into bottom of basket to form shape. Crumple up waxed paper or wrap and put into basket to shape the sides and the handle. Look at picture for the shape of the basket. Let dry overnight. When completely dry, remove the waxed paper or plastic wrap and the jug cap. Attach hanger to top of handle. Make 2 bows out of the ribbon and glue into place on either side of the basket. Check picture for proper placement. JPF Crochet Club where Crocheting is Just Plain Fun https://www.jpfun.com This pattern is for personal use only and not to be resold.